Here’s a bit of what’s been happening in green and what’s upcoming. George Washington Named One of Top 100 Green Campuses–The current issue of Sierra magazine ranks GW University No. 57 in the Sierra Club’s ranking of “Cool Schools”–colleges doing the most in terms of environmental sustainability, among schools that filled out a Sierra Club questionnaire. Some other local schools were rated out of the top 100: Goucher College (116), University of Richmond (119), and University of Maryland, Baltimore County (158). County Reaches Agreement With WGES Regarding Misleading Advertising Claims–In early August, the Montgomery County Office of Consumer Protection secured an agreement with Washington Gas Energy Services (WGES) to correct some misleading claims in its advertising. WGES is an electricity provider competing with PEPCO. The county found WGES misled consumers with claims of “guaranteed savings” and “a guaranteed low electricity price,” while comparing its offers to incorrect descriptions of PEPCO offers. WGES agreed to change its advertising, but admitted no wrongdoing. Are Organic Eggs Safer? With the recent recall of more than 500 million eggs, many from big farms in Iowa, you may be wondering whether organic eggs are safer due to the way they are produced. CNN investigated this topic (video). Sept. 1-3, 10:00 a.m. to 4:00 p.m.–Sweetgreen Job Fair, Reston, Va.–Sweetgreen, a local salad and yogurt concept (and a Bethesda Green small-business sponsor) is looking for creative, charismatic and hardworking individuals to join their rapidly expanding team. Join them at Reston Town Center this Wednesday, Thursday and Friday to learn more about this opportunity! Sept. 2, 5:00-8:00 p.m.–Bethesda Green First Thursday Happy Hour! Gather with us at Yamas Mediterranean Grill, 4806 Rugby Ave. in Bethesda, for casual conversation and social networking. This monthly event rotates venues, but has turned out to be most sustainable! Sept. 22 — Car Free Day Metro DC — Go Car Free or Car-Lite and make a difference for a day by bicycling, walking, teleworking, carpooling, vanpooling or taking transit. Pledge today and you’re automatically entered into a raffle for cool prizes! For the past decade, the worldwide environmental bandwagon has blown up; children in elementary school to senior citizens are all considering putting the world first. However, even with so many fighting to keep the world from becoming an inhabitable place to live, there are some who still believe climate change is either a hoax or completely out of our control. Some of these people are in fact related to me. At a wedding last summer, I was reunited with some cousins I do not see very often. At the reception, the issue of the environment was brought up, and I was shocked when I heard the bride exclaim, “I don’t believe in global warming. I think it’s all a bunch of crap.” I was even more taken aback when I heard another cousin agree with her. It was shocking to realize that there are people in this country who do not think that global warming is an issue, even folks from my own family. As I stood there, partly dumbfounded and partly not wanting to start a debate at a family event, I started to think about what to say to those who are similar to these family members. How are we supposed to get everyone involved in this worldwide issue, when some don’t even believe the issue exists? After much deliberation and mental rough drafts made of what I would say to these cousins when I saw them again, I came to the conclusion that this event wasn’t just about figuring out how to respond to my relatives’ reasons for not being eco-conscious. It was about discovering a passion, as corny as that may sound. Before, I was somewhat eco-conscious; my family recycled, and we were always trying to conserve electricity and water. I believed that climate change was occurring, but that was generally the extent of my involvement and concern with the future of our planet. After talking with these relatives who seemed so alien to what I had been taught, it made me realize that climate change is a larger and more important issue than I ever thought possible. It made me want to educate myself on what global warming is all about, and when I learned that conservation does not mean deprivation, I wanted to spread the word to others. That realization led me to take environmental classes in college, and even to volunteer at Bethesda Green. So, even though I may still find my cousins’ opinions slightly illogical, I can thank them for helping me realize how important this topic is to both the world and myself. Rebecca Blaskopf is a Bethesda Green intern and student at the University of Michigan. 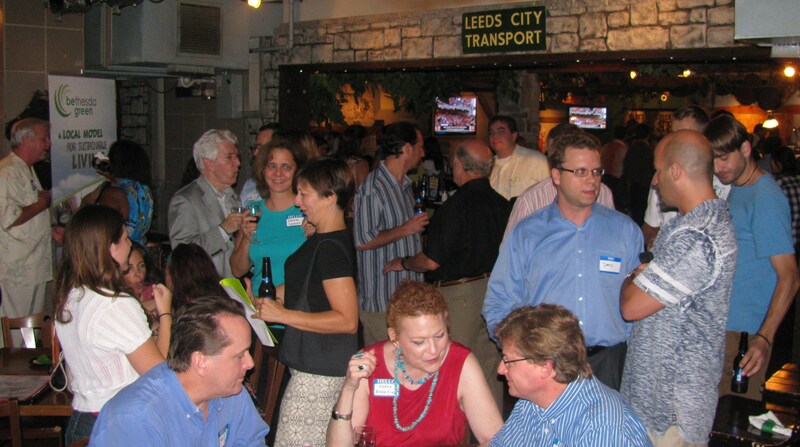 On August 5, Bethesda Green held its monthly happy hour at Union Jack’s in Bethesda, MD. The room was filled with both new and old faces, as well as great conversation and social networking. With $1 Miller Lites and $5 pizzas, it was no wonder that the event had such a great turn out. Along with great food and drink deals, the event hosted some interesting and knowledgeable companies. Members of the Potomac Conservatory were present, and gave out valuable information about what is occurring in our water systems. A Solar Energy World representative was also in attendance, as it sponsored the entire event. Not only did Solar Energy World represent the importance of alternative energy, but it also supplied appetizers and reusable bags for all in attendance. Even though those appetizers did run out early, the connections and the wonderful conversations continued until the event ended. Overall, the happy hour raised valuable funds to keep Bethesda Green helping others to learn about sustainable lifestyles as well as help other small environmental businesses grow. Thank you to all who attended; we hope you had as wonderful a time as we did! And for those who missed out, make sure to make it to our next happy hour, which will be held Thursday, Sept. 2 at Yamas Mediterranean Grill. See our Meetup page for details. The Bethesda Row Community Shred, sponsored by Bethesda Row, Equinox Fitness and Bethesda Green and held at Bethesda Lane and Elm Street on Sunday, August 15, was an opportunity for local residents to bring papers and documents to discard and shred in a secure way. Remember how rainy it was that day? The downpour did not deter people from coming out with bags of papers to shred. Someone pulled up every few minutes and got out of their car with bags – and sometimes bags and bags and bags – of papers. A crew from Clean Cut Shredding was on hand to get the paper into bins and then to their on-site shredding truck for shredding. “It’s important that we help the community,” said Dawn Jessel, Public Relations Manager. A subsidiary of Georgetown Paper Stock of Rockville, the company provides document shredding for area businesses and private homes. Clean Cut Shredding provides a high level of security and privacy when it comes to shredding papers. Shredding papers and documents is serious business. Identity theft is a growing concern – most of us know someone who was had their identity stolen and all are at risk. The FTC estimates that as many as 9 million Americans have their identities stolen each year. Shredding does help protect against identity theft, but there’s an environmental reason for shredding documents as well: It makes recycling personal documents easier. Clean Cut Shredding shreds all paper into confetti-sized pieces, and then recycles the confetti into household paper products. So, you can protect yourself and the environment by making shredding a regular part of your routine. After the event, Etman reported they shredded close to 3 tons of paper (5,500 lbs) that day, which works out to 47 trees saved! 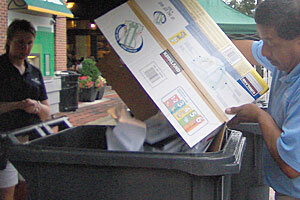 Many residents asked about the next Community Shred as they emptied their bags into the bins. Stay tuned – Clean Cut Shredding is glad to consider additional Community Shreds if there is interest and need. We’ll keep you posted! A much-anticipated program for residents seeking to make energy improvements to their homes has been put on hold before it could launch, due to concerns raised by the Federal Housing Finance Agency (FHFA), the Montgomery Gazette reported last week. The Home Energy Loan Program (HELP) would lend up to $25,000 to homeowners who had received an energy audit and wanted to make renewable energy and energy efficiency upgrades to their homes. Loan payments would be made over 15 years through a voluntary line item on the home’s property tax. In this way, HELP would make it more attractive for homeowners to consider investing in energy improvements, which can be expensive. The HELP loan would place a “first lien” on the property, so that if an owner defaults on their payments, the delinquent payments of the HELP loan would be paid off before the mortgage. In policy-speak, HELP is a Property-Assessed Clean Energy (PACE) program, one of many being proposed across the nation. A handful of states have successful PACE initiatives. According to the Montgomery Gazette, the FHFA, which regulates Fannie Mae, Freddie Mac, and the Federal Home Loan Banks, said July 6 that PACE programs would violate the agency’s principles in governing loans, and homeowners that obtain the loans could be in default of their mortgage agreement, face accelerated payments, and be prohibited from refinancing. Eric Coffman, a senior energy planner with the county Department of Environmental Protection, said the county could not move forward with HELP with such risks hanging over the heads of homeowners. Efforts are underway at the federal level to address the issue. The Gazette noted that the PACE Protection Act has been introduced in Congress. Are you waiting for HELP to come before making energy improvements to your home? Discuss the issue here! Here’s what’s happening in green in Bethesda, Montgomery County and environs. Stormwater Group Urges Increase in Fines–The Montgomery County Stormwater Partners Network wants the county to double fines for violating sediment control and illegal dumping laws. Sediment and pollution harm local creeks and affect the Chesapeake Bay. The current fine for a low-level, “Class A” offense is $500. Retailers’ Open Door Policy: Enticement or Just Waste of Energy? Some Bethesda stores leave their doors open on hot summer days in order to lure shoppers inside. Bethesda Green suggests an alternative approach. Vegans Find Oasis at Café Green–New D.C. restaurant offers healthful, mostly organic menu. Rainscapes Rewards Rebates Return! After many inquiries concerning the release date of the new Montgomery County RainScapes Rebate application, the new process and approved rebate amounts are now available! Notice that there are several changes to the process. The RainScapes program promotes and implements projects on residential, institutional, and commercial properties to reduce stormwater pollution. Applications can be downloaded by visiting: www.rainscapes.org or via the rebate page.